Popular beliefs, and comforting ones for those who want to ignore the perils of fighting white supremacy, are that Colin Kaepernick is not on an NFL roster because he’d be a distraction, doesn’t care about football, doesn’t even want to play football, is not a good player, and hasn’t come out and said he wants to play football. Chip Kelly, his former coach, has said none of these things are true. Kelly told ESPN’s Adam Schefter that Kaepernick is not a distraction, he is dedicated to football, he’s still training in New York and preparing to play and he’s a talented quarterback who should be even better in 2017. The distraction refutation has been backed up by Kaepernick’s 49er teammates who gave him the team leadership award last year. Add Kelly to the list of coaches with nothing but glowing accolades for Kaepernick which include Pete Carroll, Jim Harbaugh and John Harbaugh. Steven Ruiz notes that 144 quarterbacks have thrown at least 200 passes during their age-29 season. Kaepernick is one of those 144 guys. And 143 of those quarterbacks were on an NFL roster the following season. 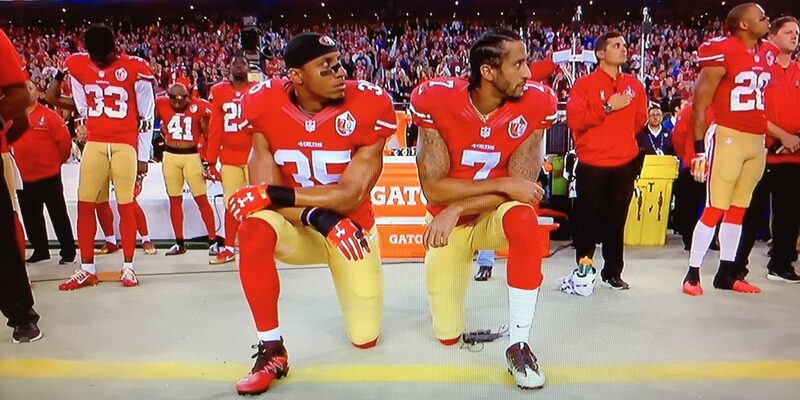 It’s looking more and more likely that Kaepernick will NOT be one of those 143 guys. This is an extraordinary case and should be treated as such. This clearly has nothing to do with football. Kaepernick is one of the 30 most talented quarterbacks on this planet. He has experience in multiple systems. He is a better quarterback now than he was when the 49ers gave him a $114 million contract in 2014. Giants co-owner John Mara told Jenny Vrentas of The MMQB that he received numerous letters from fans saying how angry they would be if a Giants player protested like former Niners quarterback Colin Kaepernick did. Chauncey DeVega chronicles white supremacy. In the United States, a white supremacist racial order was birthed by a revolt in 17th-century Virginia, when black and white indentured servants allied together to fight for their freedom and rights. White elites defeated their rebellion and instituted a system of racial classification in which white indentured servants would be given land and guns after their service was complete while blacks would be made into a permanent class of slaves. Colin Kaepernick is a direct threat to uniting those of all races against our power structure which is largely white being biracial and playing a high profile position in America’s most popular sport. With white supremacy, intent is secondary to the unequal outcomes across the colorline that individuals benefit from and perpetuate. White privilege is central here: those people considered “white” are also judged to be “normal”; the experiences of white people are taken to be universal and a baseline for how others are to be evaluated; African-Americans are judged en masse as having “bad culture” while whites are de facto viewed as having “good culture.” White people are viewed as individuals where the bad behavior of one white person does not reflect at all on the merits of the group. By comparison, African Americans and other people of color are not afforded that freedom. Ultimately, for white supremacy one’s “Americanness” is naturally linked to one’s whiteness, while the loyalty, and sense of civic belonging assigned to people of color, is contingent until proven otherwise. Colin Kaepernick, in a very visible way, has told us that his experience is very normal for black men and it does not inspire fealty to the flag. He’s rich, privileged, revered and still points to the inequity of people in this country who look like him. Colin Kaepernick fought white supremacy and won. It may cost him his job in football, but it has etched him as a hero and beacon to many who don’t view the flag with awe and respect because of how they have been treated currently and historically.